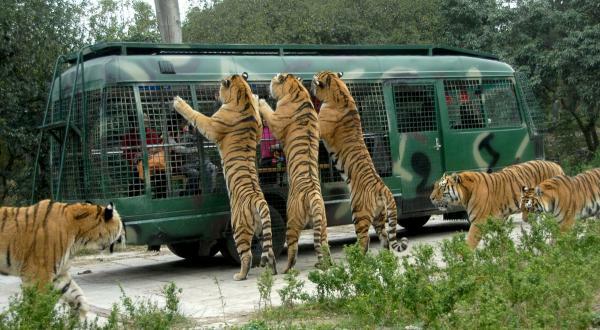 Shanghai Wild Animal Park is China's first state-level wild animal park and was built thanks to a cooperation between Shanghai Municipal People's Government and the State Forestry Administration. It occupies an area of 153 hectares and is about 35 kilometers from the city center. The park was opened to the public on November 18, 1995 and was included in the first batch of national AAAA rated tourist attractions. On May 8, 2007, the National Tourism Administration rated the park as a 5A tourist attraction. The park is home to over 200 types of representative and rare animals from around the world, with over 10,000 animals in total. These include giraffes, zebras, antelopes, and white rhinos, as well as Grade 1 National Key Protected Species such as pandas, golden snub-nosed monkeys, and golden takin. The park can be toured both on foot or by car.